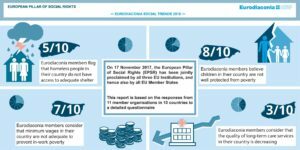 Early today, Eurodiaconia released its Report on the state of implementation of the European Pillar of Social Rights titled “Eurodiaconia Social Trends 2018 Report on the state of implementation of the European Pillar of Social Rights”. One year after the joint proclamation of the EPSR, Eurodiaconia wishes to present its members’ perspective on the state of implementation of the Pillar in 10 Member States. The report, structured in two chapters, is based on inputs from Eurodiaconia membership. The first chapter presents an overview of the state of play of selected principles of the EPSR across Member States and will flag areas that need increased attention in the years to come. The second chapter will provide a more detailed analysis of the situation in Member States with regard to the three focus areas, long-term care, housing and assistance to the homeless and access to essential services. Some best practice examples will also illustrate our member’s practical work in those areas and how they already contribute with their daily work to the implementation of the Pillar. The European Pillar of Social Rights (EPSR) has been jointly proclaimed by all three EU Institutions on 17th November 2017. Eurodiaconia was actively involved in the preparatory discussions and provided recommendations to the European Commission concerning the scope of such a Pillar of Social Rights. The Network warmly welcomed the proposed text and the proclamation by all EU Institutions. Since then, Eurodiaconia is active in keeping the discussion around the EPSR alive through participation in debates, trainings for its members and a yearly monitoring exercise of the implementation of the EPSR. Eurodiaconia will continue its advocacy work around the EPSR, in particular through its yearly monitoring report. In 2019, the network will focus on the principles 4 (active support to employment), 16 (health) and 17 (inclusion of people with disabilities). There will be dedicated webinars for each topic open to everyone and the implementation report will also have an in-depth focus on those three principles. Furthermore, Eurodiaconia will ensure that its members improve their knowledge and capacity about the EPSR through regional trainings. To know more about our members’ perspective on the state of implementation of the Pillar, check our latest study.